Bandiagara is a city in the Dogon Country of Mali. Bandiagara forms the primary entry point to Dogon Country treks. As such, one can stock up on supplies, sleep, and find guides/drivers in this town. Unfortunately due to the proximity, a lot of these items are a great deal more expensive, but it works well for those looking to find some last minute item. There are bus connections to Bandiagara, but primarily to the closer towns of Mopti and Sévaré. To go to further destinations such as Bamako requires more careful planning and the best time to catch one of these buses is on market day. Most people arrive in their own car whether hired or their own. It is a straightforward town to drive through given the small size of it. A car will allow much easier connections to villages in Dogon Country as there are no buses to these. For those looking to find a car, you are better off searching neighboring towns as prices are considerably higher in Bandiagara. For those wishing to see what there is of Bandiagara, it is very easily walked. Bandiagara is not huge on sites. The main administration building in the center roundabout is an interesting structure though. 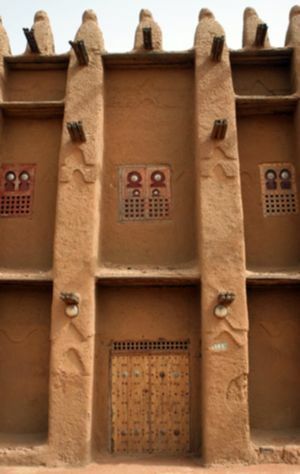 Dogon Country - It's what everyone comes to this area for as this is the gateway town to the area. Mopti - One of the nearest large towns with a historical Old Town. Sévaré - A bit closer than Mopti with a large number of hotel options, although lacking on a lot of sites to see. This page was last edited on 5 April 2010, at 23:05.